Like the typical assiduous parents of today, we’ve been reading to the kids since they were babies. Having our eldest – who turns 6 at the end of this year – learn to read and write this year has been a magical time for me. Her reading is improving in leaps and bounds, and the hesitancy with which she used to read the one-sentence books she brought home is now gone. When we go to the library each week, she’ll often find a few books, settle into a beanbag and start reading to herself. Tonight, she read five small books. Just because she wanted to. She reads to her little brother. He’s a big fan. She still wants to throw a few ‘younger’ books in the pile as she loves the illustrations (as I do), and I’ll find a few short novels that I think she’ll like. I’ll tell you the narratives I tend towards because I know the topics contrast with what she’s usually immersed in with her peer group: time travel and dinosaur tales, monsters and aliens (particularly dragons), mad scientist and experiments gone wrong, (G-rated) kungfu novels…the ones that are usually badged/branded as “for boys”. The girls’ novels are all horrendously pink and sparkly and…I just can’t do it. She chose a fairy book last time and I threw in another book about pirates for good measure. Yes, I may be fighting a losing battle. Let me retain a bit of hope for the moment. ANYway, I recently also found Gabrielle Wang’s The Lion Drummer, on the shelves. I chose it in the hopes that E. would find it fun and interesting and possibly reflecting a life in Australia that had similarities with hers. I try not to be too sledgehammery in my quest to ensure that the kids have a diversity of narratives and characters in their books. I’ve not focused on Chinese Australian or Asian Australian children’s lit. to any great degree, but I am aware of mixing up the material that crosses their cultural radars. I knew of Gabrielle’s work already, having read The Race for the Chinese Zodiac to the kids when they were a bit younger (and we took it out again just the other day) and following her on Twitter (@GabrielleWang). 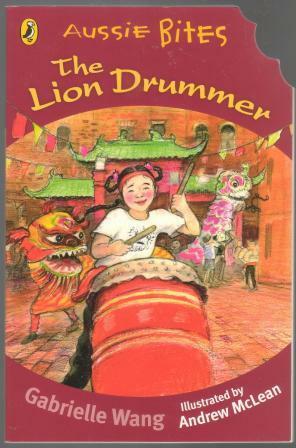 In The Lion Drummer, the book’s protagonist, Lulu, is determined to learn the drum, even though everyone around her declares that the notion of girls drumming just doesn’t fit with the old ways (which, apparently, cannot be changed). Her family is foregrounded as a group that she feels uncomfortable with because she conceives of their contrasting opinions and perspectives as being out of rhythm with each other. Despite setbacks and disapproval, she finds a way to learn and practice the drumming (for which she has much talent). In the end, it’s a happy ending. When her parents, impressed and proud of her festival performance, present her with the new drum, I almost lost the ability to read the book to my daughter. It caught me by surprise because, while I enjoyed reading the story and kind of knew how it was going to end (happy, family and community acceptance, finding her own way through), the effectiveness of the prose crept up on me. I struggled through the last few pages, my daughter not seemingly the wiser. I told my daughter I was writing this review of the book and asked if she wanted to give her take on the book. She said, “I like the dragons and lions!”. And I love a book that manages to bridge generational tastes and desires. I hope the narrative and ‘lesson’ about persistence and being true to self stays with my 6-year-old. But I’ll be happy if all she remembers are the dragons and lions dancing on the streets of Australia. They weren’t in my childhood memories, growing up in 1970s Brisbane, and I can’t help wishing that they had been. I don’t have young children any more but your review reminded me of the joys of reading to my children and sharing my favourite books as they grew older. I relate to your distaste for pink books. I too tried to balance my children’s reading and when they pressed me to read one of those I introduced them to the world of literary critique. I didn’t want to censor my children’s reading but to guide them towards books that exhibit the best use of language and deeper thought. Your account of The Lion Drummer reminded me of reading Nadia Wheatley’s My Place to my 7-11 year old children. Writing for children is an art that when done well not only absorbs children in the story, but entrances adults as well. Thanks for your thoughtful comment. The whole idea of introducing the kids to the culture of reading is magical to me. This is so true. I’ve discovered so many beautiful stories through reading to the kids. I’m loving moving into the novellas and smaller books now that the elder one is about 6. I know I get into them sometimes more than she does, but she’s always keen to hear them through. I’m perpetually keen on going to the library and checking out what’s on the junior fic shelves. I didn’t think I could love libraries more but, since taking the kids there every week, I think my regard for them has grown ten-fold. The highlight of our week when the children were kindergarten age was attending story time at the local library. We used to come home with a large number of books then settle on the couch and snuggle up to read. Story time introduces children to a reading community and the idea that books are to be shared with others. I’ve sorted through the many children’s books that we acquired through second hand bookshops and presents, picked out the cream and boxed them up. When my niece and nephew come to stay they are there waiting for us to read once again.